My weekend kicked off a bit early, as I had taken Thursday off work to volunteer with Defy Ventures. Defy is a truly incredible organization; you can read about my last experience with them here. 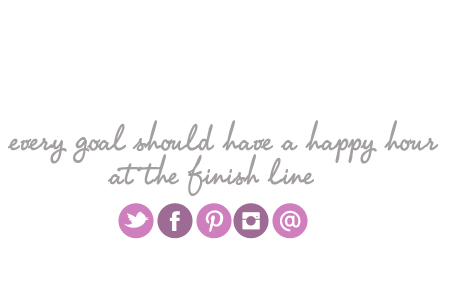 This time, we were launching a program at a brand new prison: La Vista Correctional Facility (LVCF), which is all women! While I thought I knew what to expect from my previous experiences with Defy, the women at LVCF defied my expectations. The energy in the room was entirely different from the men I had worked with previously. While usually the new EITs come into the program pretty unsure, the women were already excited about the program outcomes, and were very quick to open up. “Step to the line” involved not just tears and reflective silence, but some laughter and smiles and even chatter. And while us volunteers make it a point never to ask the EITs why they’re in prison or how long they’ll be there, over lunch, several of the women opened up to me over lunch and told me exactly what their crimes were. I left feeling like I had not only made a difference in some of the EITs lives, but also made friends that I truly look forward to seeing again. When I got back up home, one of my weekend guests was already there: my old New York roommate Liz! We haven’t stayed in close touch, but Liz lives in Vermont now and frequently comments on my Instagram Stories about skiing, to which I always tell her she should come out and join me for some fabulous Rockies snow instead of the East Coast ice she’s used to. Well, it finally happened! We kicked off her visit with dinner at one of my favorite restaurants, Empire Lounge in Louisville. 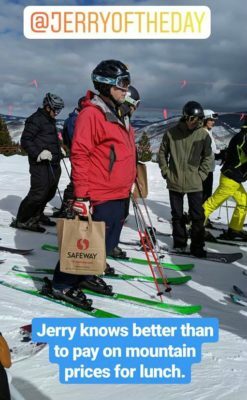 We woke up on Saturday morning psyched to ski… but Liz unfortunately was feeling the high altitude pretty hard. We headed over to Beaver Creek, but after some warmup runs, she still wasn’t feeling any better. We ended up taking a bunch of lodge breaks to try to help her feel better, and I also snuck a few runs of my own in while she was resting. On our lunch break at Talons Lodge, I heard someone calling my name, and turned to find my friend Chad sitting at the next table over. When I went over to talk to him, the woman next to him stood up. “Laura?” she asked. It was Stacey, the volunteer coordinator from Defy! Stacey and Chad didn’t know each other; they just happened to share a table at lunch. What a small world! That totally made my day to see them both. Although the snow hadn’t been all that great in the morning, it softened up somewhat in the afternoon – but by then we were a bit tired. I wished I could have gotten in some more runs! In general, I’m really starting to feel the scarcity of the season… while in years past I have been excited about warm weather for running / hiking, this year I am totally dreading the end of skiing, and understanding why so many skiers get sooooooo excited in November when the snow starts to fall. I’m looking forward to staying in Superior a bit more rather than always heading to the mountains on weekends, but there’s also just something so relaxing about getting away from “real life”, skiing all day, and cozying up in my ski house at night. With Liz and Erik, though, we didn’t stay in at night, but headed for an evening on the town in Vail Village. 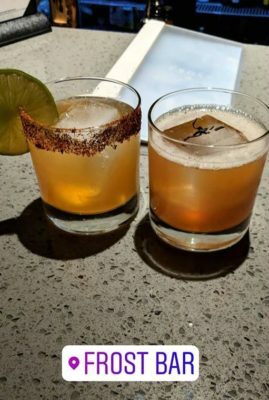 We kicked off with cocktails at Frost, the bar where my roommate works, and I absolutely loved the “Steep in the Right Direction” cocktail I had. Ingredients: Woodford Reserve bourbon, St. Germain Elderflower liquor, smoked early grey tea, honey ginger, and lemon. In general, any cocktails with tea are always delicious! I was really impressed by Frost though – will definitely need to make it a spot I visit more often. From there, we headed to Vendetta’s for dinner, made more special by the fact that Erik’s friend’s sister was our waitress. I had the seafood cioppino, which wasn’t really fisherman’s stew, but seafood over pasta with red sauce. 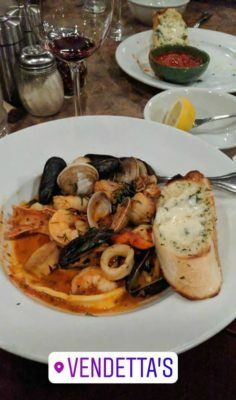 This was perfect for me – I had been looking for pasta with red sauce a seafood on the menu and settled on cioppino as a compromise instead! While Erik and some others headed out for more revelry after dinner, Liz and I called it a night afterward, hoping that her altitude sickness would ease up after a solid night’s sleep. How can you not sleep well when this little guy is waiting for you to come to bed? 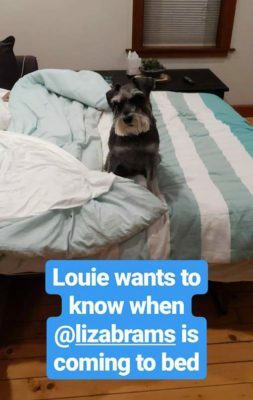 My roommate’s dog Louie is the best! Unfortunately, while we got plenty of rest and Liz originally was optimistic, a few runs at Vail found her back to feeling headache-y and nauseous. And on top of that, while our group (which included Erik’s friends Nikki and Greg) was having a good time, we all agreed that the snow was pretty poor. No bueno!I felt terrible that there was nothing I could do to help her feel better, and all of us decided to call it a day on skiing by noon. While originally Liz was planning to stay in the mountains till Tuesday, she instead decided to come back with me to Superior to see if a night at lower altitude would help.